In addition to ultrasonic cleaning, many parts, such as these tubes and jets, are cleaned using proprietary processes that as you can see do a wonderful job. 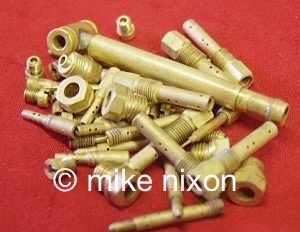 Pretty, brightly cleaned brass. And no abrasives used! Some folks abrasive blast these parts, but I regard that bad practice. I use special techniques for special parts. Gotta treat this stuff right, you know.